A special "Symphony Lover's Weekend" package is available at the Courtyard by Marriott Shippensburg for $370 per couple and includes a meet and greet with the conductor, two Orchestra tickets to both Concerts II and III, two overnight stays at the Courtyard, two breakfasts and free time to explore the region. Visit cyshippensburg.com and use the promo code "NCL" or call the Courtyard Shippensburg at (717) 477-0680. This offer is valid through July 7, 2017. Shippensburg Festival Symphony is an ensemble of professional musicians from Pennsylvania, Maryland, New York, and Virginia. The orchestra was formed to provide regional audiences with top-quality professional orchestral performances. Robert Trevino has rapidly emerged as one of the most exciting American conductors performing today. Trevino burst into the international spotlight with unprecedented success at the Bolshoi Theater in December 2013, when he led a new production of Verdi’s Don Carlo substituting for Vasily Sinaisky. The enthusiastic audience and Russian press praised Mr. Trevino, “There has not been an American success of this magnitude in Moscow since Van Cliburn". He was subsequently nominated for a Golden Mask award for “Best Conductor in a New Production". Appearances with some of the world’s top orchestras have followed in what can only be described as a sensational rise, since his initial success as a laureate of the Evgeny Svetlanov International Conducting Competition in France. Debuts with the Orchestra Philharmonique de Monte Carlo with Mahler’s Fifth Symphony have led to extensive touring plans throughout Europe and Asia, including inaugurating the new hall, Opera di Firenze of the Maggio Musicale Fiorentino. Elsewhere in France, his regular appearances at La Folle Journee and La Roque D’Antheron, also resulted in immediate reengagements and a feature on the Arte Channel as well as broadcasts on France Musique and Radio France. Maestro Trevino returns for his fifth season with the Shippensburg Symphony Festival Series, a welcome return for his many fans in the region! 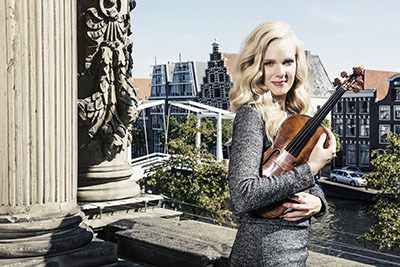 Hailed for her “brilliant… polished, expressive and intense” (Cleveland Plain Dealer) and “absolutely stunning” (Chicago Tribune) playing, Dutch violinist Simone Lamsma is respected by critics, peers and audiences as one of classical music’s most striking and captivating musical personalities. Conductor Jaap van Zweden with whom Simone enjoys a regular collaboration, describes her as one of the leading violinists in the world. With an extensive repertoire of over 60 Violin Concertos, Simone’s recent seasons have seen her perform with many of the world’s leading orchestras. Highlights for the 16/17 season include debuts with the National Symphony Orchestra of Washington, National Arts Centre Orchestra Ottawa, Vancouver Symphony, BBC National Orchestra of Wales, RTE and Iceland Symphony, as well as return invitations to the London Philharmonic, Dallas Symphony, San Francisco Symphony, Oregon Symphony, Seoul Philharmonic, Residentie Orchestra and Royal Flemish Philharmonic. Simone began studying the violin at the age of 5 and moved to the UK aged 11 to study at the Yehudi Menuhin School with Professor Hu Kun. At the age of 14 Simone made her professional solo debut with the North Netherlands Orchestra performing Paganini’s 1st Violin Concerto, her debut highly praised by the press. She continued her studies at the Royal Academy of Music in London with Professor Hu Kun and Professor Maurice Hasson, where she graduated aged 19 with first class honours and several prestigious awards. In 2011, she was made an Associate of the RAM, an honour given to those students who have made significant and distinguished contributions to their field. Simone currently lives in The Netherlands. Simone plays the “Mlynarski” Stradivarius (1718), on generous loan to her by an anonymous benefactor. Please Note: soloists and performers for all Festival Series performances are subject to change.